Introduction : Guarana is a plant named by the Tupi tribe in the Amazon (wara-ná), who use the seeds to brew a drink. Today, guarana seeds are still used as medicine. Guarana is used for weight loss to enhance athletic performance, as a stimulant, and to reduce mental and physical fatigue. It is a frequent addition to energy and weight loss products. Some people also use guarana to treat low blood and chronic fatigue syndrome (CFS), and to prevent dysentery. It is also used to enhance sexual desire, to increase urine flow, and as an astringent. Guarana contains caffeine. Caffeine works by stimulating the central nervous system (CNS), heart, and muscles. Guarana also contains theophylline and theobromine, which are chemicals similar to caffeine. 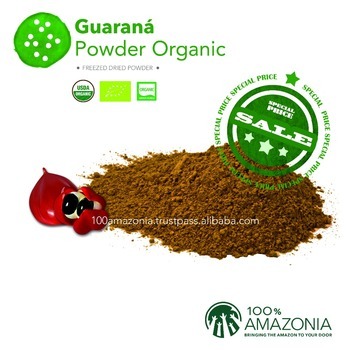 Product description: Guarana powder is made by sun-drying then roasting for finishing at (low temperature max. 43C) and milling fresh organic guarana seeds. After milling, the powder passes through sieving for granulometry standardization and is packed into cylindrical kraft paper cylinders. Product is suitable for raw food diets.